Mushroom-like currents (vortex dipoles): one of the most widespread forms of non-stationary coherent motions in the ocean (K.N. Fedorov, A.I. Ginsberg). Modelling of mushroom-like'' currents (vortex dipoles) in a laboratory tank with rotating homogeneous and stratified fluids (K.N. Fedorov et al.). On the multitude of forms of coherent motions in marginal ice zones (MIZ) (A.I. Ginsberg, K.N. Fedorov). Differential rotation (beta-effect) as an organizing factor in mesoscale dynamics (V.D. Larichev). Geostrophic regimes and geostrophic turbulance beyond the radius of deformation (B. Cushman-Roisin, Benyang Tang). The evolution of cooling rings (W.K. Dewar). Vorticity frontogenesis (M.E. Stern). Weakly non-local solitary waves (J.P. Boyd). Nonlinear intrusion (D. Nof). The decay of mesoscale vortices (R.P. Mied). Ekman dissipation of a barotropic modon (G.E. Swaters, G.R. Flierl). On the stability of ocean vortices (P. Ripa). Influence of topography on modon propagation and survival (G.F. Carnevale et al.). Mesoscale structures on density driven boundary currents (S.A. Condie). Factors influencing asymmetry and self advection in ocean eddies (D.C. Smith IV, A.A. Bird). Barotropic and baroclinic instabilities of axisymmetric vortices in a quasigeostrophic model (X.J. Carton, J.C. McWilliams). Eddy-genesis and the related heat transport: a parameter study (S.S. Drijfhout). Eddy generation by instability of a highly ageostrophic front: mean flow interactions and potential vorticity dynamics (R.A. Wood). Eddy-current interactions using a two-layer quasi-geostrophic model (M. Ikeda, K. Lygre). Simulation of ocean tomography in a QC model (F. Gaillard). Simulation experiments of the evolution of mesoscale circulation features of the Norwegian coastal current (P.M. Haugan et al.). Numerical modeling of Aghulas retroflection and ring formation with isopycnal outcropping (D.B. Boudra et al.). Evolution of rings in numerical models and observations (E.P. Chassignet et al.). 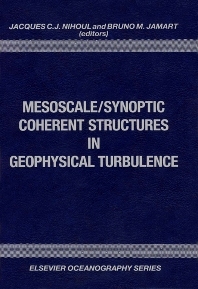 The role of mesoscale turbulence in the Aghulas current system (J.R.E. Luthjeharms). Modelling the variability in the Somali current (M.E. Luther, J.J. O'Brien). General circulation of the mid-latitude ocean: coupled effects of variable wind forcings and bottom topography roughness on the mean and eddy circulation (B. Barnier, C. Le Provost). Asymmetrical wind forcing driving some numerical eddy-resolving general circulation experiments (J. Verron, C. Le Provost). On the response of the Black Sea eddy field to seasonal forcing (E.V. Stanev). The dynamical balance of the Antarctic circumpolar current studied with an eddy resolving quasigeostrophic model (J.-O. Wolff, D.J. Olbers). A limited-area primitive equation model of the Gulf stream: results in statistical equilibrium (J. Dana Thompson, W.J. Schmitz, Jr.). A synopsis of mesoscale eddies in the Gulf of Mexico (A.W. Indest et al). Mesoscale eddies and submesoscale, coherent vortices: their existence near and interactions with the Gulf Stream (J.M. Bane et al.). A summary of the Optomo program's mesoscale ocean prediction studies in the California current system (M.M. Rienecker, C.N.K. Mooers). Geometry-forced coherent structures as a model of the Kuroshio large meander (T. Yamagata, S. Umatani). The behavior of Kuroshio warm core rings near the eastern coast of Japan (T. Matsuura, M. Kamachi). Advective surface velocities derived from sequential images of eddy fields (M. Kamachi). Laboratory experiemnts on dipole structures in a stratified fluid (G.J.F. van Heijst, J.B. Flor). On tripolar vortices (R.C. Kloosterziel, G.J.F. van Heijst). Laboratory studies of isolated eddies in a rotating fluid (J.A. Whitehead). Laboratory studies of pseudo-periodic forcing due to vortex shedding from an isolated solid obstacle in a homogeneous rotating fluid (G. Chabert d'Hières et al). Time-dependent rotating stratified flow past isolated topography (D.L. Boyer et al.). Flat vortex structures in a stratified fluid (S.I. Voropayev). Laboratory experiments with baroclinic vortices in a rotating fluid (A.G. Kostianoy, A.G. Zatsepin). Long-lived solitary anticyclones in the planetary atmospheres and oceans, in laboratory experiments and in theory (M.V. Nezlin, G.G. Sutyrin). Numerical modelling of the formation, evolution, interaction and decay of isolated vortices (G.G. Sutyrin, I.G. Yushina). Eddy-resolving model of idealized and real ocean circulation (D.G. Seidov et al.). On the evolution of intensive cyclonic-anticyclonic vortex (G.I. Shapiro, V.N. Konshin). Forecast of intense vortex motion with an azimuthal modes model (G.G. Sutyrin). On the dynamics of lenslike eddies (G.I. Shapiro). Synergetics of the ocean circulation (D.G. Seidov). A survey of observations on intrathermocline eddies in the world (A.G. Kostianoy, I.M. Belkin).